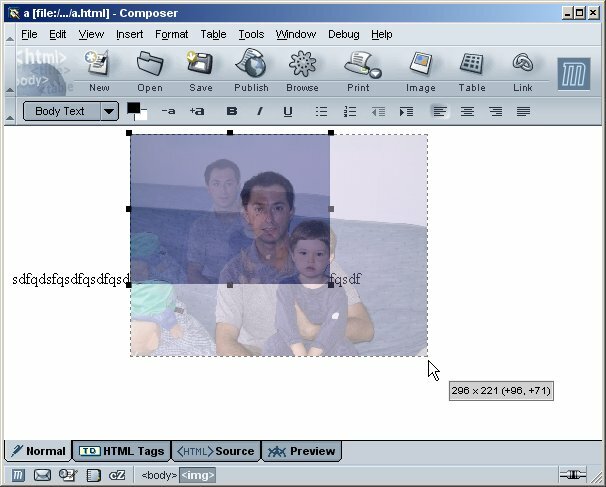 Daniel Glazman writes: "Thanks to the fix for bug 47066, recent Mozilla nightly builds now allow resizing of images and tables with the mouse in Composer and HTML mail composition. All embeddors of the HTML editor can also enable or disable this feature. If an image is selected or if the caret is placed inside a table, eight resizing handles appear and allow to resize the image/table with a simple click/drag/release. In the case of an image, the resizing is done real-time and a semi-opaque shadow of the image at its target size is shown during resizing. A tooltip shows in real-time the target size in pixels, and the relative change in pixels too." Even if you never use Composer or HTML mail composition, you'll want to try this out at least once because it looks really cool. More and more features from non-browser apps such as photo editing tools are appearing in Mozilla; this really proves that Mozilla is a really righteous Web platform that can literally do nearly anything we want it to. Photo editing? Does this feature actually resize the image file or just change the HTML img height and width attributes? "Does this feature actually resize the image file or just change the HTML img height and width attributes?" The latter (though it alters the width and height properties in the style attribute if you've got Composer set up to use CSS). That's a pity. It would be really great if the real image (or a backup) would be resized automatically. A normal user doesn't have to even know the difference between real resize and html/css-resize imho. Is there a setting to maintain aspect ratio whilst dragging (or is this enabled by default), as some of us have difficulty judging this sort of thing by eye whilst dragging. It'll also help out people using laptop trackpads and with limited motor control. "Is there a setting to maintain aspect ratio whilst dragging (or is this enabled by default), as some of us have difficulty judging this sort of thing by eye whilst dragging." The four corner handles maintain the aspect ratio. Personally, I'd like to be able to over-ride this (perhaps by pressing shift?) as it can be nice to do freehand resizing with just one handle. Yup just read the bug (doh, should have done that before asking) and I saw that the original XBL version did keep aspect ratio using the corners, so guessing that the C rewrite would have had that too. Personally I think the keep aspect ratio with corners/stretch on sides actually sounds fairly intuitive, although it might be nice to be able to change this on an image-by-image basis, I believe many (paper) publishing tools allow you to do this. It would be supercool if this worked in the browser too. Are there any docs on how to embed theeditable HTML widget in a native app ? A really nice thing would be a widget like GtkEmbedMoz (say, GtkEmbedMozEditable) so that we can use the editable HTML widget in mailers and WYSWYG native HTML composer applications. Cool! Go for the kill!